I had an intense discussion from late morning until after lunch. 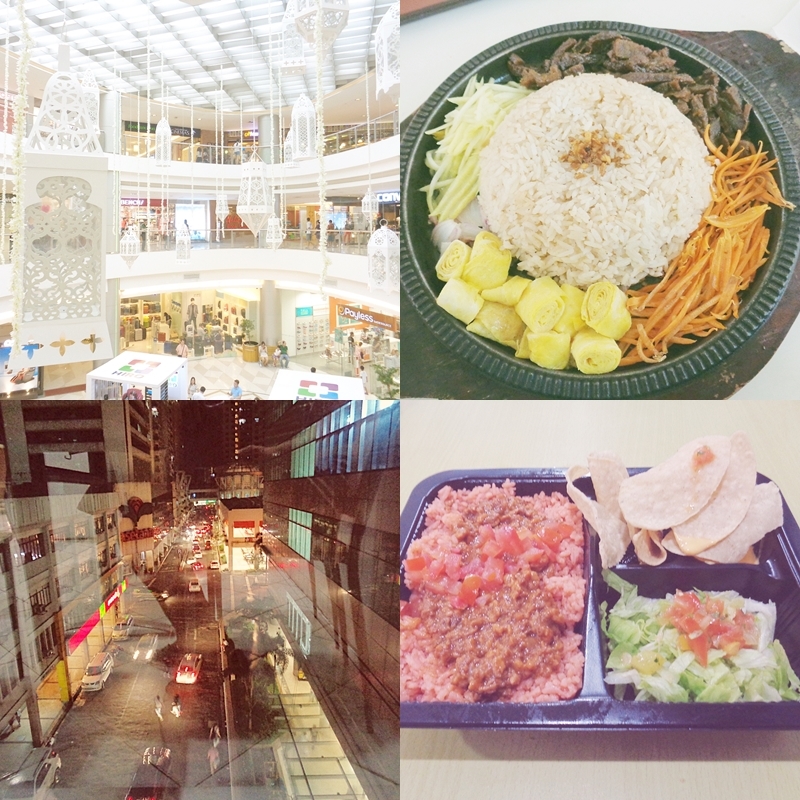 Since I rarely visit the Makati Area, I took the chance to explore Landmark and Glorietta. I spent so much time in Landmark's Home Section (of all places). This is probably the effect of gaining so much weight and aging. Clothes and all those prettifying stuff no longer interest me that much. 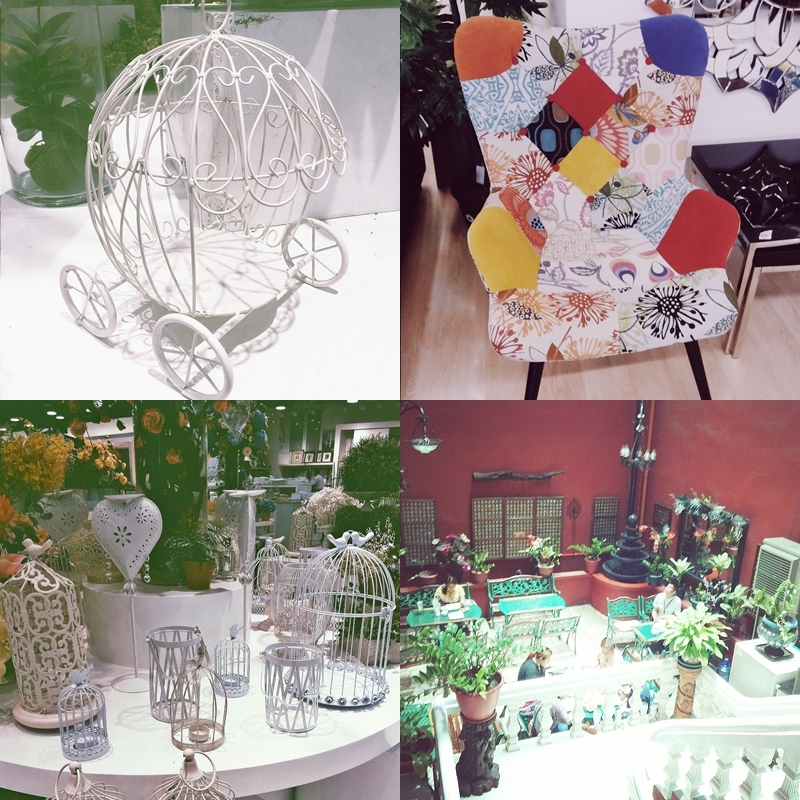 I fell in love with a few furniture pieces, treasure boxes, and the bird cage inspired lamps and decor. I was able to control my shopaholic hormones so I ended buying the much needed bed sheets for our home. I had a great shopping deal only to forget that I'm traveling on my own. I didn't realize how heavy were the paperbags. I wanted to explore SM Makati but the paperbags were punishing me. I made another mistake of taking the pathway to the MRT. I was already too tired so I gave in. I was hoping that the train will be better. I made another stupid decision. I had a repeat experience and by the time I alighted from the rain the heavy paperbags were suddenly ruined. Award for the most embarrassing moment of the year! If only I look as good as Rebecca Bloomwood, I wouldn't mind. Hahaha Perspiration and oiliness to the highest level! I walked, carried the paperbags and lined up in the supermarket for my saving grace... the cheapest eco. bag to salvage the heavy bed sheets. I ended having early dinner in a fully airconditioned restaurant (another mistake) because by the time I got home, it felt like my head will explode because of the worst headache. Meanwhile, here are a few of the many things that caught my attention in Landmark's Home Section. I never purchased any of these. The bird cage inspired decors and lamps are love! Although I know another place where to get this cheaper. Hehehe I love the chair although the people around me doesn't see any inch of beauty. All the more when they learned the price tag, whooping Php 20,000!! Patio de Conchita - The last photo from the right was taken from one of famous restaurants in Intramuros. This reminds me, I have to take decent photos and prepare a separate blog post for this beautiful place. You can never go wrong with your favorite cake :) I was feeling down the entire week. 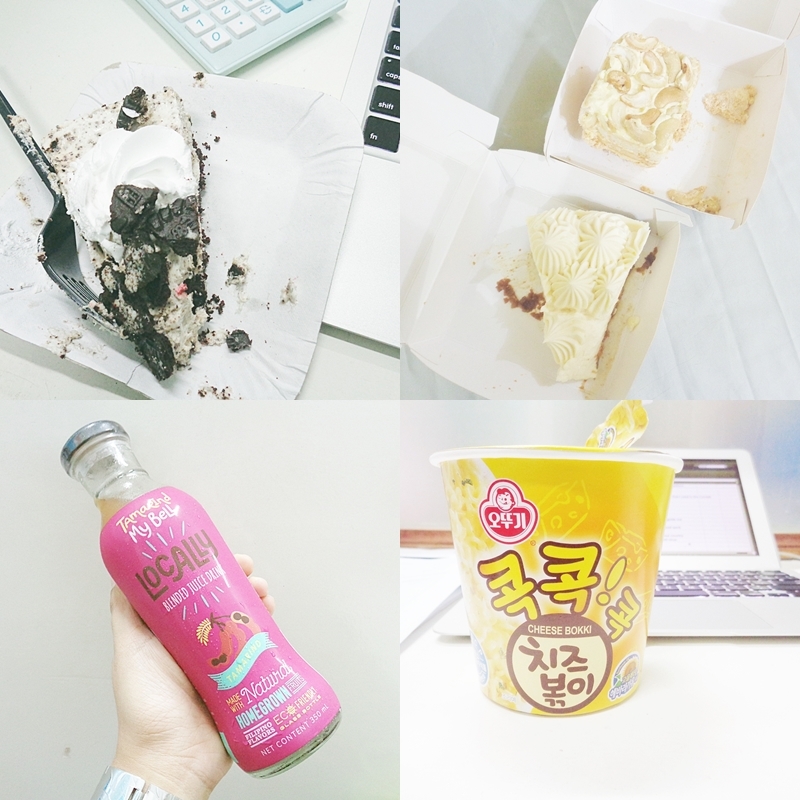 To console myself, I gave in to these sinful treats. Oreo cheesecake at the workplace and a few slices from Mary Grace. Tamarind Juice Drink - Sounds weird, indeed. Discovered this from 7-11 and out of sheer curiosity, I gave it a try. It really tastes tamarind!!! Cheese Bokki - This cheese flavored noodles caught my attention. Although expensive at Php 60, it has become my new favorite. Cheese soup! It felt like a dream come true for the "CHEESE-iest" person in me. These shabby chic lamps! - I dragged my friend A to Lucky Chinatown Mall only because I wanted to vent out my frustrations over a plate of Thai meal. Hahaha The mall never fails to impress me with their decors. I love the humongous shabby chic lamps hanging from the mall's highest ceiling. I took a sudden leave from work for 2 days. To wake up with a decent sunrise is something I've been deprived over the last 11 years?! Haha I have an overflowing pool of leave credits. 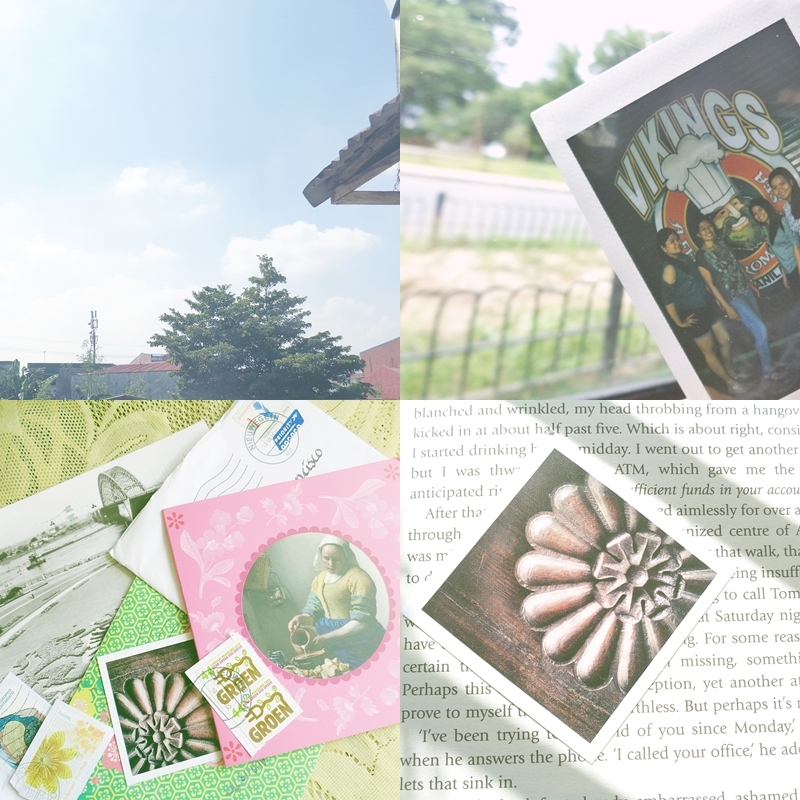 I realized that it's not so bad to pause for a while especially when everything seems to turn out so worse. Postcards - Dear Marieken, All your letters arrived before the week ended. I love the green envelope. Photography from Marieken - The favorite photo deserves a separate photo. I admire your eye for photography Marieken. Yay, happy to see you got mail :-) Did they all arrive at once? I hope this week goes better for you. I'm sorry that last week was so difficult. You are very good about looking at the positive. It's so fun getting letters! Also, I would have to agree with the MRT situation. I'm so glad that I'm now working at QC, no need to ride the train!